Q: Do I need to allow extra space when setting up my new Basket Buddy? A: When measuring the space for the Basket Buddy, allow 5 inches more in depth than the actual Basket Buddy measurement, because the baskets will extend out the back. Q: I am having trouble assembling the Basket Buddy. A: When assembling a Basket Buddy, go online and blow up the model chosen without the baskets. You can see where each of the parts go. The bottom shelf can be positioned either 3 or 5 inches from the floor, depending on whether you want more space for the lower baskets or more space to clean under the shelf. 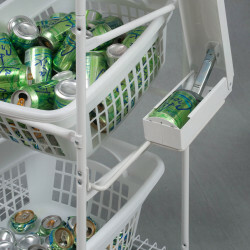 Q: Will any laundry basket work with the Basket Buddy system? A: Other baskets besides the ones we sell can be used with the Basket Buddy. 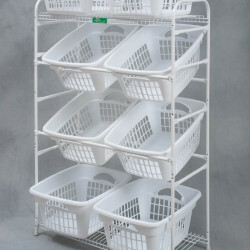 The easiest fit are laundry baskets that hold between 1.25 and 1.75 bushels. Some baskets are flimsy and tear easily–others are strong and durable. All laundry basket have lips which will hold them in the Basket Buddy. Q: How do you best remove baskets from the Basket Buddy? A: When removing a basket from the Basket Buddy, push the front lip of the basket off its holding bar and pull the basket forward under the front holding bar. Q: Can the baskets be affixed to the frame? A: If a Basket Buddy is used for laundry and not near the washer, a basket is removed when it is filled and taken to the washer. 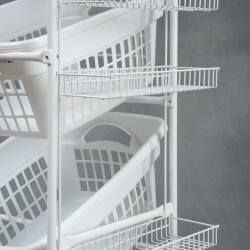 If the Basket Buddy is near the washer, the baskets do not have to be removed and the front lip of the baskets can be secured to the front bar by plastic tie downs. Also, if a Basket Buddy is used for storage, tie downs can be used. Q: How can we label the baskets? A: Some families use a Sharpie marker or tags to identify what goes in each basket. Some families assign a basket to each member. No two families use a Basket Buddy the same way–so use your imagination how you use yours–and let us know on Facebook. Q: Will other baskets besides the one that you sell fit the Basket Buddy? Q: How do I get information from others about using the Basket Buddy? A: Share with others how you use your Basket Buddy on Facebook, Pinterrst, or Twitter.